I, (Rebecca) needed to take some very serious time for prayer in order to do right by this beautiful guy's introduction. You see, this particular horse is very, very special. We feel that all of our sweet horses here at the ranch are special, don't get me wrong, but this guy is a little different. He represents something different from the others. First, I'll give you his name. My husband Steve, named this guy Trojan. The meaning of his name is: of ancient Troy or it's people or culture. A person born or living in ancient Troy. A strong, hard-working, determined person. Second, his breed. 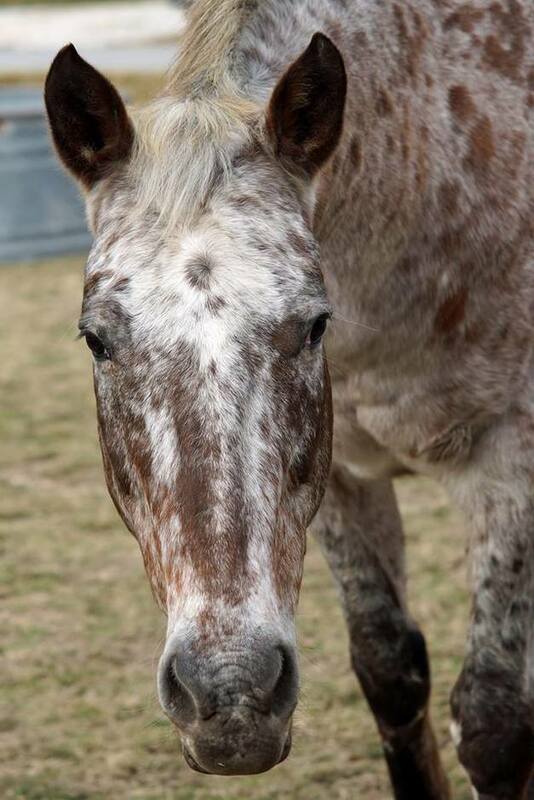 Trojan is a Appaloosa. The Nez Perce Indians are noted for having developed this breed. "As white settlers moved into traditional Nez Perce lands, a successful trade in horses enriched the Nez Perce, who in 1861 bred horses described as "elegant chargers, fit to mount a prince." These horses were versatile, strong and agile athletes, noted for their unique spotted pattern coloring . They were excellent, swift, strong battle horses. Trojan has been gifted to the ranch by Rob and Gina Bomstad, in honor of Rob's brother, Troy Bomstad. On Februray 18th, 2017, Troy Michael Bomstad died of suicide. Troy was Steve's cousin. We are so very grateful for their precious gift in Troy's name. As you all probably know, ARRYR was founded to help those who deal with many things, especially mental health illnesses. The ranch was named for my daughter Autumn, who also died of suicide. Over the last year, our family has been touched twice more by the death of a loved one by suicide. It has been a personal mission for me, for the ranch, to bring awareness for the prevention of suicide. Trojan is our battle horse, our war horse. He is ridden by many children and teens and is their counselor, companion, confidant, minister, comforter, and friend. Trojan will be ridden into battle everyday to fight a war that may be going on within the hearts of the kids that come here. God will use this amazing horse to do mighty things. We have no doubt that God will use this horse to heal and soothe many a young one that need to be here. God will use this mighty horse to encourage, empower, uplift, to inspire. God will use this incredible horse in the daily battle all of us face in some way, every single day. Trojan will help someone find their voice to reach out and say what's inside. Trojan will make a difference for someone. So here's to Trojan, given in honor of Troy. Trojan is of Troy. To sponsor Trojan, please email us at info@arryr.org for more information.